Derailleur hanger for Rockrider 5.3 2011. Rockrider 560 27.5 2016 derailleur hanger 6061 T651, made with CNC technology. Made in Italy. Rockrider 8.3 2005 derailleur hanger 6061 T651, made with CNC technology. Black anodized. Lighter and more durable than the hanger series. 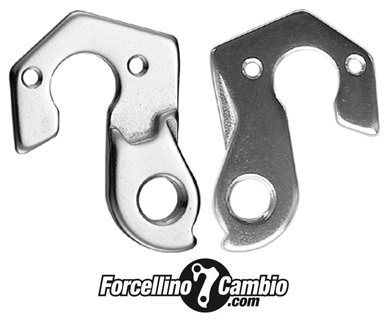 Derailleur hanger for Rockrider FR6 EVO 2013, aluminum 5086 CNC machined Made in Italy. Rockrider 520 derailleur hanger Union model GH-063. Material 6061 aluminum cold forged anodised silver. Rockrider FR10 2010 aluminum derailleur hanger 6061 T651, made with CNC technology. Black anodized. Lighter and more durable than the hanger series. Rockrider 500 2015 derailleur hanger. Rockrider Drowp 9 2013 deraillue hanger.